Blythe Mullen, 8, reaches for a cue card from her mother, Jessica Mullen. She spoke at the Day of Mourning in Albany, New York, on Feb. 23 about her adoption story and her dream of seeing abortion end. “What if there was no me?” Blythe asked. 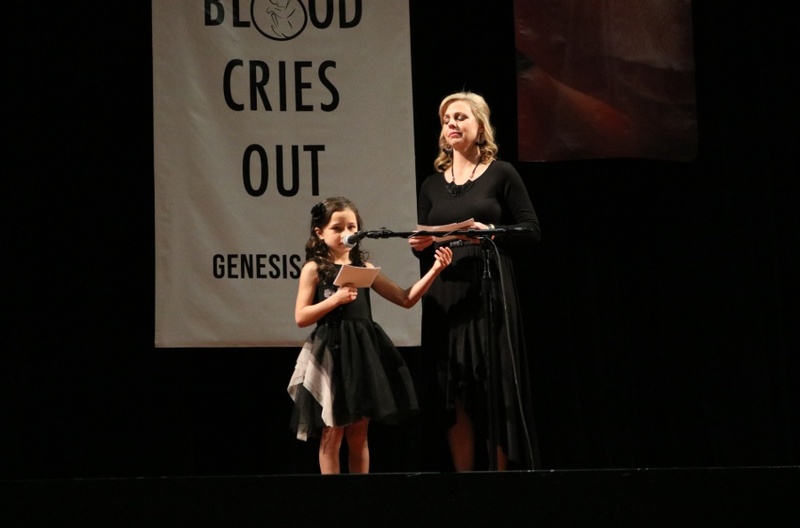 People sniffled, sobbed and applauded as Blythe Mullen, age 8, shared her story of adoption in Albany, New York, at the Day of Mourning on Feb. 23. Thousands gathered or streamed the Day of Mourning live. The event, created in response to the outcry over the New York abortion law, gave people an opportunity to mourn and repent for abortion in America. “Over 61 million other little boys and girls just like me were not given that chance,” Blythe said. “How many more? How many more will die this way? Blythe’s adopted parents started a ministry called Option Adoption shortly after adopting Blythe. They told The Stream how Blythe’s adoption spurred them to action. “When we realized how brave her birth mother was, we were like, wow, how many other women see adoption as a true choice?” Jessica Mullen said. After some research, they realized that very few pregnant women choose adoption over abortion. Jessica Mullen shared that their family travels to abortion clinics together and shares the message of the gospel and the options of parenting or placing for adoption. They walk alongside moms who choose life for their babies and help them through the process. Blythe and her brother come along and help share the message of life. “Blythe has a real passion for this topic,” Mullen said. “She understands her testimony and how special it is that her birth mother chose life for her. Blythe was a little hesitant to speak to me. Mullen told me she’s not usually shy, and encouraged her to share. Soon she answered a question for me. She did so with conviction, as if speaking a deeply-held truth. “How do you know that you were wanted?” I asked. It’s a probing question, but Blythe proved ready to answer.